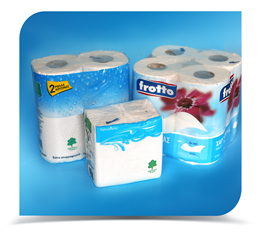 LDPE film is extruded and printed by flexographic high definition printing. Then on a slitter rewinder the rolls are carefully slitted and rolled in smaller rolls according to customer’s needs. Material: LDPE co-extruded with modified coefficient of friction in inner and outer layers , antistatic, and high clarity or white colored. Transparent or white LDPE in thickness from 30 to 55 microns. Flexographic high definition printing up to 10 colors inner layer. Total width of rolls up to 1200 mm. Total outer diameter of rolls : up to 1000. Inner core diameter from 76 mm.